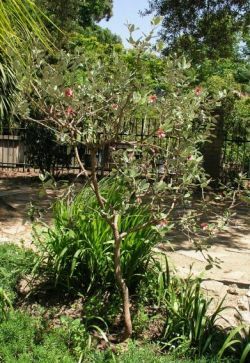 Comments: Broadleaf evergreen flowering plant native to Argentina, Brazil and Uruguay in South America. 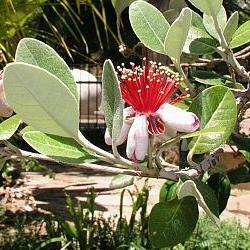 This tree has 2" gray-green eliptic leaves, large mauve colored flowers with red stamens, and small pear shaped fruit. Some varieties of this plant are low growing while others can be 15' tall and just as broad.